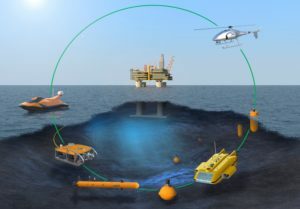 Complex maritime robotic system provides the interaction of the underwater, surface and air unmanned vehicles (groups of vehicles). Intellectual information management system (IMS) allows to significantly simplify and automate the control of the robots. With the IMS an operator can develop a task (mission), test it, program the functioning of each robot, monitor the process execution and the technical condition of the elements of the complex robotic system, collect and process the incoming information, quickly correct the actions or change the mission completely.